do you see your damage? do you realize my truth? I am an alien in a land of normal. I was struck deeply with the news of Robin Williams' passing. Even though it has been several weeks since his passing, I mourn the passionate and creative spark that he gave so lovingly to all of us. This poem, written part in grief and part in the lack of acceptance many gifted individuals experience, is meant to highlight intensities that when not accepted will lead to the person feeling out of place in this world. I would like to share Dr. James T. Webb’s August 12th post from LinkedIn: “The brightest, most creative individuals often suffer from depression, as did Robin Williams who died yesterday of an apparent suicide. His death was a tragic loss to us all. I have no doubt that he was a highly gifted man who struggled with existential depression. His intensity, sensitivity, and search for life meaning, characteristic of so many gifted people, permeated his life. This was evident in his movies like Dead Poets Society and Good Will Hunting that portrayed the social and emotional needs and conflicts of gifted and talented people who struggle in a search for idealism and excellence in a world of mediocrity that so often seems uncaring and that fails to understand zany creativity that helps us laugh at tragedy. In his idealism, he was disillusioned many times, and he wrote about it candidly, including how he used alcohol to numb himself from his pain. Many other bright and creative minds like Robin Williams are facing similar struggles. I hope we can help them find a better solution so that they don't feel like Mork from Ork waiting for a mother ship to come rescue them from this strange world. 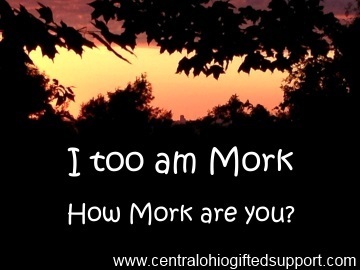 How often do you feel like Mork?